Is It the Right Career Choice for You? Read, Review, and Study Each Lesson: Take the quiz at the end of each lesson; you can always retake it if you don’t do well the first time. These quizzes will help you prepare for the final exams. Take the Final Exams:This final step consists of transcribing 7 different audio files accurately. Once you pass the program with a final qualifying score, you will receive your certificate of completion. After passing the course, you will also be eligible for an internship with a reputable transcription company to gain valuable experience with real projects. Transcriptionists need to have the right resources and equipment handy to be able to perform their tasks. The proper equipment includes mp3 playback software, word processing software, time markers, headphones, and a transcription foot pedal. Transcriptionist resources include eBooks, articles, slideshows, infographics, and videos that cover relevant content. Send us any questions you have on the general transcription training course by filling out our "Contact Us" form. How to become a transcriptionist from home? 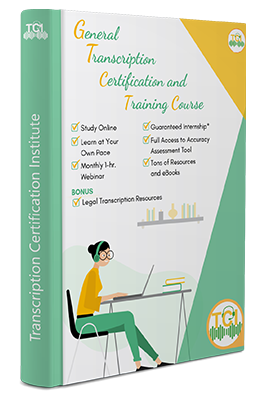 To become a home-based transcriptionist, you need to enroll in an online transcription course like the one offered by TCI. The course will equip you with the necessary skills and knowledge to get you started and become further acquainted with the ins and outs of the transcription field. What are the required skills to become a transcriptionist? You need to have high proficiency in English -- including grammar and punctuation -- great typing skills, the ability to listen carefully and be computer-savvy. If you have these skill sets, then transcription may be the career for you. Have more questions? Check Out FAQs Here!